Cook's Third Voyage : Descriptions of Polynesian Surf-Riding, 1777-1779. Excerpt 1 : John Ledyard, Marine, 'Resolution'. Excerpt 2 : George Gilbert, midshipman 'Resolution'. Excerpt 3 : David Samwell, Surgeon's Mate, 'Resolution'. Kealakekua Bay, Hawaii, March 1779. Ledyard, John: A Journal of Captain Cook's Last Voyage to the Pacific Ocean, and in Quest of a North-West Passage, between Asia and America; Performed in the Years 1776, 1777, 1778 and 1779. National Geographic Society, Washington, D.C., U.S.A., 2005. On the 17th January, 1779, we entered our harbour, which was a comodious bay situate nearly in the middle of the south side of Owyhee, and about a mile and a half deep, the extremes of the bay distant about two miles. We entered with both ships, and anchored in 7 fathoms water about the middle of the bay having on one side a town containing about 300 houses called by the inhabitants Kiverua, and on the other side a town containing 1100 houses, and called Kirekakooa. While we were entering the bay which they called Kirekakooa after the town Kirekakooa we were surrounded by so great a number of canoes that Cook ordered two officers into each top to number them with as much exactness as they could, and as they both exceeded 3000 in their amounts I shall with safety say there was 2500 and as there were upon an avarage 6 persons at least in each canoe it will follow that there was at least 15000 men, women and children in the canoes, besides those that were on floats, swimming without floats, and actually on board and hanging round the outside of the ships. The crouds on shore were still more numerous. The beach, the surrounding rocks, the tops of houses, the branches of trees and the adjacent hills were all covered, and the shouts of joy, and admiration proceeding from the sonorous voices of the men confused with the shriller exclamations of the women dancing and clapping their hands, the overseting of canoes, cries of the children, goods on float, and hogs that were brought to market squalling formed one of the most tumultuous and the most curious prospects that can be imagined. While James Zug notes in his introduction (page XXI and following) that Ledyard substantially plagerized several of the available published accounts of Cook's voyages, this is the only written report of surfboards ("floats") in use as water transport on the expedition's initial entry into Kealakekua Bay, Hawaii, on 17th January 1779. As such it confirms the illustration by John Webber, see below. Ledyard's estimation of the number of canoes and their occupants is significantly larger than reported by King: "about the Resolution 500 Canoes and about the Discovery 475", see below. Quoted in De Vega (ed, 2004), page 15. Christine Holmes (editor). Captain Cook's Final Voyage: The Journal of Midshipman George Gilbert. : Caliban Books, Horsham, Sussex. University of Hawaii Press. 1982. Page? February, 1779. Probably at Kealakekua Bay. 1. "have a method of swimming upon a piece of wood"
This reference only records the use of a surfboard as a mode of transport, as illustrated in Webber's illustration and does not indicate surf-riding activity. This overwise simple observation, may however establish a relationship between board paddling and the development of Polynesian swimming technique - the overarm stroke with flutter kick. 2. "form of a blade of an oar"
Indicates the board was flat and probably possiblyly with a rounded, not a square, nose. These dimensions are close to Samwell's "a thin board about six or seven foot long & about 2 (foot) broad "
Dimensions are not included in either of the published entries attributed to James King. Significantly, this report notes the characteristics of the template, probably 16'' wide near the nose and a 9'' tail. 4. "four or five inches thick, in the middle tapering down to an inch at the sides."" The thickness and rail taper are also not included in the other reports from the voyage. The thickness seems extreme compared with later accounts and to existing examples from the period. 5. "having the broad end foremost"
The widest part of the board is the nose. 6. "They lay themselves ... betweeen their legs." A detailed account of the mechanics of board paddling. 7. "... the most expert of our people ..."
Patrick Moser noted, July 2006 (see Correspondence) "This last observation at leasts suggests that some of Cook's men may have tried paddling (or surfing?) on these boards themselves." I would contend that the report specifically records attempts by members of the crew to paddle the boards, without success. The skill of board paddling is fundamental to successful surf-riding and it is often overlooked by modern commentators. The report is also consistant with Ellis' comment (see Point 5) that implies the boards have been examined closely and must have been held to report the weight. Furthermore, the sentence also conforms with the relective nature of the account, that probably indicates it is based on multiple observations. "George Gilbert’s writing has been lauded as even-handed, even mature, reminiscent of the “magnificent lack of imagination” displayed by the younger James Cook in his Endeavour journal. George Gilbert joined Captain Cook’s 1776 expedition as a seaman and was promoted to midshipman during the voyage. His father George Gilbert had served as master on the the 'Resolution' for its preceding voyage to the Pacific, during which time Cook had named Gilbert Island off the coast of Tierra del Fuego for him. Upon his father’s retirement, John Gilbert had been replaced as master by William Bligh, later deposed as captain during the mutiny on the Bounty. While in his late teens or early twenties, Gilbert was on the 'Resolution' when Cook visited Nootka Sound and undertook repairs from late March 1778 until April 27. His extensive account of their travels was not included within The Journals of Captain Cook. Vol. 3. Parts 1 & 2, Resolution and Discovery—as were extracts from journals by his contemporaries Anderson, Clerke, Burney, Williamson, Edgar and King—because Gilbert’s 325-page manuscript journal was likely completed in the early 1780s. Gilbert’s memoir was not published until two centuries later, 80 years after a descendant of Gilbert’s brother, Richard Gilbert, took the manuscript to the British Museum in 1912. After Cook’s death, Gilbert transferred to the 'Discovery' under Captain Clerke and was paid off at Woolwich on October 21, 1780. He became fifth lieutenant on the warship 'Magnificent' until 1783. The year and nature of his death are not known. Gilbert’s original journal is in the British Museum." - ALAN TWIGG / BC BOOKWORLD AUTHOR BANK. 1. I originally sourced part of the first sentence from De Vega (ed, 2004), page 15. Critically, it did not include the final phrase "... to an inch at the sides." 2. Following the posting of Samwell's account to Joe Tabler at surfbooks.com, I was contacted in July 2006 by Patrick Moser, Drury University, who provided the complete Gilbert quotation, as posted above. This last observation at leasts suggests that some of Cook's men may have tried paddling (or surfing?) on these boards themselves. See Point 7. above, full email attached below. Thanks to Patrick Moser for his substantial contribution to this subject. Gloustershire GL56 0YN. 2005. Pages 146 and 147. Referenced as Samwell page 1164. Samwell in Cook:Voyages (1991), Volume 3, Part 2, page 1164. The Motion is so rapid for near the Space of a stones throw that they seem to fly on the water, the flight of a bird being hardly quicker than theirs. So true it is that many seeming difficulties are easily overcome by dexterity & Perseverance. (16)"
1. "a number of boys & young Girls"
Samwell notes that surf-riding is a community activity including both sexes and juvenile riders. He later makes his remarks more specific, see 13. 2. "a great swell rolling into the Bay." Suitable swell conditions are not consistently available and in this case breaking close to the shore. 3. "a thin board about six or seven foot long & about 2 (foot) broad "
This dimensions appear practical and are close to Gilbert's "about six feet in length, 16 inches in breadth" - see Extract 1. 4. "swim off shore to meet the Surf "
Paddling out through the surf line. 5. "in readiness & turn their sides to it"
The rider's preparation and positioning for the take-off. 6. "to be involved in it"
Possibly indicates a take-off in the white-water or the broken water of a wave. Technically a wave of translation. 7. "get just before it or rather on the Slant or declivity of the Surf"
This appears to indicate the riders attempt to ride on the sloping wave face, in preference to the white-water. declivity : a downward slope, Macquarie Dictionary (1991). 8. "lie with their Hands lower than their Heels laying hold of the fore part of the board which receives the force of the water on its under side"
Possibly indicates that the rider's feet were raised out of the water. 9. "an incredible Swiftness to the shore." The speed of the riders is often reported by early observers, this may indicate that "swiftness" was a factor of angling across the wave face and travelling faster than the wave speed. Banks (1769) uses exactly the same expression. See Banks : Tahiti 1769 Note 12. 10. "too near in to afford them a tolerable long Space to run before it they dive under it with the greatest Ease"
Also reported by Banks, Note 14. 11. "& proceed further out to sea." A continuous process of wave riding followed by paddling back out through the surf. 12. "Sometimes they fail in trying to get before the surf, as it requires great dexterity & address, and after struggling awhile in such a tremendous wave that we should have judged it impossible for any human being to live in it, they rise on the other side laughing and shaking their Locks & push on to meet the next Surf when they generally succeed, hardly ever being foiled in more than one attempt." The most dramatic feature of this account, the sentence may indicate that if the rider is unable to maintain a position on the wave face ("fail in trying to get before the surf") they may be caught and enveloped in the white-water - "in such a tremendous wave ... impossible for any human being to live in it". At an extreme (certainly not fully confirmed by the text), this section could be interpreted see as the first description of a "tube-ride" or "cover up". Modern Boogie riders frequently ride so far back in the curl that the impact zone eventually propels the rider out the back of the wave - "they rise on the other side". Despite Samwell's practical assessment of the intrinsic danger of the activity ( see Note 14, below), the rider's treat the situation with disdain - "laughing and shaking their Locks". 13. "Thus these People find one of their Chief amusements"
Given the generality of this comment, it may indicate that Samwell had previously viewed the activity and/or that he had heard other reports by members of the crew. 14. "young boys & Girls about 9 or ten years of age"
Samwell attempts to specifically estimate the age of some of the participants, see Note 1. 15. "no other than certain death." Certainly for a 18th century European, who probably could not swim, the activity was extreme. The inherent danger of the activity is often overlooked by surf-experienced commentators. 16. "So true it is that ... Perseverance." Samwell draws a philosophical conclusion. "David Samwell sailed on the Third Voyage on the Resolution as Surgeon's mate, later transferring to the Discovery. He was born in Nantglyn, Wales in 1751 and died in London in 1798. Prior to his death he had been a surgeon to British troops at Versailles in France. Samwell kept a journal on the Third Voyage, which contains one of the most detailed descriptions of the events surrounding Cook's death. He was also a respected poet who wrote verse in English and Welsh and was honoured at eisteddfods. There is a short biography of him in the Dictionary of National Biography (vol.17, p.732)." - The Wills of men who sailed with Captain James Cook 4: S to Z.
Excerpt 4 : Lt. James King #1, Unedited Version (1967). Beaglehole, John C. (editor) : The Voyage of the Resolution and Discovery 1776 - 1780. Cambridge Hakluyt Society, Two Volumes. Volume 1, page 268. 1967. Surfing – A History of the Ancient Hawaiian Sport. 1996. Appendix B. Page 97. The People of Kealakekua Bay : Canoe Construction and Repair. King in Cook: Voyages (1991), Volume 3, Part 1.
which is this; when a man wants a Canoe he repairs to the wood and looks about him till he has found a tree fit for his purpose and a convenient spot for his work; having succeeded thus far, he runs up a house for his present accommodation and goes to work upon his Canoe, which they in general compleatly finish before it's moved from the spot where its materials had birth. Our people who made excursions about the Country saw many of these Canoes in different states of forwardness, but what is somewhat singular, if one of their vessels want repairing she is immediately removed into the woods though at the distance of 5 or 6 miles. These people are exceedingly populous; the day we went first into Care'ca'coo'ah Bay there were counted about the Resolution 500 Canoes and about the Discovery 475, a great many of these were large double Boats carrying ten or twelve Men so that here was a vast concourse of People; however many of these were assembled from various parts of the Isle, and some I know came from the Isle of Mow'wee, but the immense number of Men and women living in the various villages about this Bay surpassed every idea of populousness I could ever form, and the abundant stock of Children promised very fairly a plentiful supply for the next Generation. King in Cook:Voyages (1991), Volume 3, Part 2, page 628. "But a diversion the most common is upon the Water, where there is a very great Sea, & surf breaking on the Shore. The Men sometimes 20 or 30 go without the Swell of the Surf, & lay themselves flat upon an oval piece of plank about their Size & breadth (1), they keep their legs close on top of it, & their Arms are us'd to guide the plank, they wait the time of the greatest Swell that sets on Shore, & altogether push forward with their Arms to keep on its top (2), it sends them in with a most astonishing Velocity & the great art is to guide the plank so as always to keep it in a proper direction on the top of the Swell, & as it alters its directn (3). If the Swell drives him close to the rocks before he is overtaken by its break; he is much prais'd. On first seeing this very dangerous diversion I did not conceive it possible but that some of them must be dashed to mummy against the sharp rocks, but just before they reach the shore, if they are very near, they quit their plank, & dive under till the Surf is broke, when the piece of plank is sent many yards by the force of the Surf from the beach. By such like excercises, these men may be said to be almost amphibious. The Women could swim off to the Ship, & continue half a day in the Water, & afterwards return. The above diversion is only intended as an amusement, not a tryal of Skiil, & in a gentle swell that sets on must I conceive be very pleasant, at least they seem to feel a great pleasure in the motion which this Exercise gives. (5)"
1. "an oval piece of plank about their Size & breadth"
Notes a shaped the nose and maybe tail, the dimensions are difficult to estimate. Probably not longer than the rider's height, this width could vary from 15'' to 20'' for adult riders. They may have approximated six feet long and by eighteen inches wide (6ft x 18''). 2. The necessary dynamics of wave selection and the critical nature of take-off positioning ..
"wait the time of the greatest Swell ...(and) push forward with their Arms to keep on its top"
3. The necessary dynamics of positioning the board in the correct planning angle on the wave face ..
"the great art is to guide the plank so as always to keep it in a proper direction on the top of the Swell." Subsequent accounts also confirm the neccessity of adjusting the board to the correct planning angle on the wave face for successful surf-riding. This was noted by Blake (1935, pages 41 - 42. ) and Finney and Houston (1966, page ?) as strong evidence that the ancient Hawaiians rode waves, in this respect, in exactly the same manner as (their) contemporary surf-riders. "the force of which they avoid, diving & swimming under the water out of its impulse." "they seem to feel a great pleasure in the motion which this Exercise gives." These extracts, dated March 1779, are taken from two published versions of the expedition's log. For the first account of a previously unencounted and dynamically difficult activity, the information of the combined versions is remarkable. It clearly demonstrates the powers of observation and critical analysis required by an officer in the British navy in the 18th century and an appreciation of skilled maritime activity. King's account is probably based on examining the surf-riding on a number of occasions. It is possible that on occasion, King's observations were from a boat on the water. There are significant differences in the two accounts. "... the official publication ... was heavily edited by ... Douglas ... adding marterial of his own and from other accounts of the voyage." - Footnote, Page 32. Given that the additional details of the edited version closely correspond with modern surf-riding experience, in this case the information is unlikely to be from Douglas' imagination and more likely from other eye-witness sources. Excerpt 5 : King # 2, Edited Version (1784). A Voyage to the Pacific Ocean Undertaken by Command of his Majesty For Making Discoveries in The Northern Hemisphere Performed Under Captains Cooke, Clerke, Gore in Years 1776, 1777, 1778, and 1780, being a copious and Satisfactorary Abridgement. G. Nicholl and T. Cadell, London, page ?. 1784. Surfing – A History of the Ancient Hawaiian Sport. 1996. Chapter 3. Page 32. "Whenever, from stormy weather, or any extraordinary swell at sea, the impetuosity of the surf is increased to its utmost heights, they choose that time for their amusement (1), which is performed in the following manner : Twenty or thirty of the natives, taking each a long narrow board, rounded at the ends (2), set out together from the shore. The first wave they meet, they plunge under, and suffering it to rollover them, rise again beyond it (3), and make the best of their way, by swimming, out into the sea. As soon as they have gained by these repeated efforts, the smooth water beyond the surf, they lay themselves at length on their board, and prepare for their return. Those who succeed in their object of reaching shore, have still the greatest danger to encounter. The coast being guarded by a chain of rocks, with, here and there, a small opening between them, they are obliged to steer their boards through one of these (6), or, in case of failure, to quit it, before they reach the rocks, and, plunging under the wave., make the best of their way back again. This is reckoned very disgraceful, and is also attended with the loss of the board, which I have often seen, with great horror, dashed to pieces, at the very moment the islander quitted it. (7)"
1. The challenge of extreme conditions ..
"Whenever ... the impetuosity of the surf is increased to its utmost heights, they choose that time for their amusement,"
2. "a long narrow board, rounded at the ends"
Vague and indeterminate dimensions, but notes shaped the nose and maybe the tail. body through the base of an approaching wave. In contemporary surf-riding this is known as a "duck-dive". Although commonly used by body-surfers, it is more difficult when attempted with a board. "The first wave they meet, they plunge under, and suffering it to rollover them, rise again beyond it ..."
"As the surf consists of a number of waves"
"by mistake they should place themselves ..., they are left exposed to the fury of the next"
"The coast being guarded by a chain of rocks ... they are obliged to steer their boards through". "the loss of the board ... dashed to pieces, at the very moment the islander quitted it." First drawing of a surfboard, circa 1779. A View of KaraKakooa, in Owyhee. An engraving based on an original drawing at Kealakekua Bay, 1779. Printed in the official account of the voyage, Plate 68. John Webber , Engraving by W. Byrne: "A View of KaraKakooa, in Owyhee", 17 January 1779. Cropped version from Kampion (1997) Page 32. An engraving based on an original drawing by expedition artist, John Webber, of Captain James Cook's arrival at Kealakekua Bay, Hawaii 17 January 1779. Printed in the official account of the voyage, Plate 68..
Finney and Houston (1966) Page ?? Margan and Finney (1971) Pages 20 - 21. Nat's History (1983) Page 33. Lueras (1984) Pages 44 - 45 and 47. De Vega (ed, 2004) Page 15. In an attempt to locate the possible surf-riding locations of these reports, the following details have been collated from Robson (2000). Resolution and Discovery, the ships of James Cook's third Pacific expedition, initially anchored and landed at Waimea River mouth, Kaui on 20th January 1778, staying for four days. Finney and Houston (1996), page 31, identify three ancient surf-riding sites at Waimea River mouth, Kauai. Departing on 24th January, the next anchorage and landfall was near Leahi Point on the island of Nihau on 29th January 1788. After a further stay of approximately four days, Cook left on 2nd February 1778 to explore the North West Pacific. Finney and Houston (1996) identify one ancient surf-riding site near Leahi Point, Nihau, page 31. Cook's expedition returned to the Hawaiian Islands on 26th November 1778. Without landing, he met with Kalani'opu'u (the king of the island of Hawaii) off the coast of Maui near Kahului on the following day and subsequently set sail for the big island. The prevailing weather conditions and the failure to locate an anchorage suitable to Cook's requirements, delayed a landing until 16th January 1789. The arrival in Kealakekua Bay, Hawaii was greeted by over a thousand canoes as illustrated by John Webber's "A View of KaraKakooa, in Owyhee, 17 January 1779." This is the first European depiction of a surf-board. See below. Finney and Houston (1996) identify one ancient surf-riding site specifically at Kealakekua Bay, Hawaii. Furthermore, they identify another thirty two ancient sites within approximately 30 kilometres (23 miles) of Kealakekua Bay, pages 28 and 29. After an extended stay of nineteen days, the ships left Kealakekua Bay on 4th February 1779. Unfortunately for Cook, Resolution's mast broke after two days sailing and he was forced to return to on the 11th February. Simmering cultural differences resulted in a violent confrontation on the 14th February wherein Cook, and twenty-one others, died. Command of the expedition fell to Charles Clerke, previously the captain of the Discovery, who was able to restore relations. Clerke determined that he should continue to fulfil Cook's orders and the expedition left Kealakekua Bay for the North Pacific on 22nd February, 1779. The return necessitated by Resolution's broken mast lasted eleven days, which brings to a total of thirty days that Lt. King spent in and around Kealakekua Bay, Hawaii. The next anchorage was three weeks later at Waimea Bay, Ohau, on the 27th February, but was only for one night and they sailed west on the 28th. Finney and Houston (1996), page 38, identify one ancient surf-riding site specifically at Waimea Bay, Ohau. On the 2nd March 1779, the expedition returned to its previous anchorage at Waimea Bay on Kaui. Relations were strained (mostly due to local problems) and after a stay of six days, Clerke relocated to the previously used anchorage off Leahi Point, Nihau on the 8th March. This was the final landfall in the Hawaiian Islands, a stay of five days. The expedition departed for Kamchatka on the 15th March, 1779. In total the ships of Cook's third pacific expedition were anchored in Hawaiian waters for 49 days. The longest was at Kealakekua Bay, Hawaii (30 days) but much of the return visit would have been preoccupied with Cook's violent death and its aftermath. It would appear that Lt King's observations were most probably at, or around, Kealakekua Bay. Note that there are no reports from Hilo Bay on Hawaii or Wakiki on Ohau, apparently the two major centres of ancient Hawaiian surf-riding. Also note that at this time of the year the predominant swell direction is the famed winter swells originating in the North Pacific, and the extended anchorage's were all on the southern coasts. Generally, the southern coasts best surf-riding conditions are with the summer swells from the southern ocean, although some may also be exposed to winter swell from the west. See below. If the Kona coast surf-riders had been questioned as to the suitability of the conditions, their response may have translated as approximately ... "You really missed it - you should have been here six months ago." (after Brown, 1966). The one northern anchorage, at Waimea Bay on the island of Ohau, was only for one night (27 - 28 February 1779). 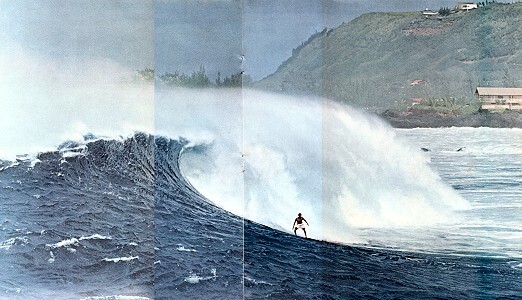 Given the modern reputation of this location for big wave surf-riding at this time of the year, it appears that Clerke's decision to relocate to Waimea Bay on Kaui was sensible. See below. The above details of Cook's voyages were largely collated from Robson(2000). Information specifically relevant to Hawaii was selected from pages 154 to 155, pages 159 to 160 and the maps 3.12, 3.23, 3.24 and 3.25. Waimea Bay, Ohau under large swell conditions. Photograph possibly by Don James Life Magazine, April-May 1965 ? Firstly, I must acknowledge the significant information provided by Patrick Moser, Drury University to the content of this paper. His various contributions are noted throughout and a full copy of his July 2006 email is attached, below. Three excerpts are attributed to surgeons - Anderson, Ellis and Samwell. Two reports are by naval officers Clerke and King, and one by a midshipman, GeorgeGilbert. The final report, attributed to King, is a construction by Rev. Douglas and bears little relationship to King's report in Beaglehole (1967). I have attempted to note the earliest publication of each extract and any subsequent reproduction. The rank of the crew members is given at the time of their report. Note that after Cook;s death there was a re-allocation of duties on both vessels. I have made an attempt to note the possible locations of the accounts, essentially by correlating Finney and Houston (1966) and Robson(2000). An extended analysis is included at Surf-riding Locations. The quotations have their original spelling and grammar, however I have spaced each sentence to be consistent with my preferred monitor presentation (as illustrated here). The biographical notes are brief, with a focus on the the history of the publication. I would like to thank Alan Twigg, British Columbia, for permission to quote from his extensive notes. Where applicable, I have included some comments noting the research thread. THE VOYAGES OF JAMES COOK R.N. James Cook lead three scientific and exploratory expeditions to the Pacific Ocean for the British Navy, from 1768 to 1780. The voyage was expertly recorded (note Cook's superb mapping techniques) and returned a huge collection of cultural and botanical specimens, largely due to Joseph Banks and Dr Solander. These elements were also features of the subsequent voyages. The second voyage (1772 - 1775), in the Resolution accompanied by the Adventure, firmly located the known islands of the Pacific ocean and discovered several others. It was probably the first voyage below the Antarctic Circle and was terminal for the theory of Terra Australis incognita. The voyage emphatically proved the worth of John Harrison's maritime chronometer to calculate longitude and set new standards of naval health care - of four deaths, only one crew member died of sickness. Cook recognized Polynesia as a distinct cultural entity and largely defined its massive spread across the Pacific. The third voyage (1776 - 1780), also in the Resolution but now accompanied by the Discovery, failed to locate the North West Passage but in the process an extensive area of the North Pacific coasts was explored and mapped. Further Pacific islands were discovered, notably the Hawaiian islands, where Cook would be killed at Kealakekua Bay, Hawai'i on the 14th February 1779. Command of the expedition and the Resolution fell to Charles Clerke, the captain of the Discovery who had sailed with Cook on his previous two Pacific voyages. Lt. James King of the Resolution was promoted to first lieutenant. John Gore, Cook's first lieutenant who had sailed on the Endeavour, took command of the Discovery. Other crew members of the Resolution included artist John Webber and Master William Bligh. Clerke determined that he should continue to fulfil Cook's orders and leaving Hawaii in March 1779, the expedition returned to the North Pacific. Charles Clerke died at sea on the 21st August 1779 and Gore took command of the Resolution with King taking command of the Discovery. Following the return to England on the 4th October 1780, King was selected to edit the logs and journals to prepare them for publication. "Usually cited as the first European to set foot in British Columbia, James Cook posthumously published the fifth earliest account in English of the first British landing in British Columbia. The British Admiralty published an edited account of Cook’s voyages in three quarto volumes and a large atlas in 1784-1785, now generally known as 'A Voyage to the Pacific Ocean'. The journals were heavily edited by Dr. John Douglas, Bishop of Salisbury. As commissioned by the Lords of the Admiralty, Douglas embellished much of Cook’s original journals with material gleaned from Cook’s officers. Some of the more sensational revelations added to the text were designed to encourage the spreading of “the blessings of civilization” among the heathens and to help sell books. For almost 200 years Douglas’ version of Cook’s writings was erroneously accepted as Cook’s own. Cook’s journal, with its bloody ending supplied by James King, proved popular. Within three days of its publication in 1784, the first printing was sold out. There were five additional printings that year, plus 14 more by the turn of the century. Translations were made throughout Europe. The original version of Cook’s journal was edited by J.C. Beaglehole and finally published for scholars in the 1960s. It reveals that Cook was a somewhat dull reporter, more interested in geography than anthropology. The profits from the publication of Cook’s journals went to the estates of Cook, James King and Charles Clerke (Commander of the Discovery), with a one-eighth share for William Bligh, master of the Resolution, because his surveying work was so essential. Please pass this along as a response to Geoff Cater on early historical accounts of surfing. In the course I teach on surf history and culture (at Drury University), and in an anthology that I've been putting together based on this course, I've come across a number of these early accounts by Cook's mariners. Journals of Captain James Cook on his Voyages of Discovery_ edited by J.C. Beaglehole (Cambridge UP, 1955-67). Samwell's entry dates from January 22, 1779, and so possibly precedes King's, whose description takes place between their arrival on January 18 and their departure in March. Besides the entries by Joseph Banks on Cook's first voyage (which Joe passed along not too long ago) and the famous description of Tahitian canoe riding by William Anderson (not James Cook) on Cook's third voyage, here are several more that may be of interest. "These People handle their Boats with great dexterity, and both Men and Women are so perfectly masters of themselves in the Water, that it appears their natural Element; they have another convenience for conveying themselves upon the Water, which we never met with before; this is by means of a thin piece of Board about 2 feet broad & 6 or 8 long, exactly in the Shape of one of our bone paper cutters; upon this they get astride with their legs, then laying their breasts along upon it, they paddle with their Hands and steer with their Feet, and gain such Way thro' the Water, that they would fairly go round the best going Boats we had in the two Ships, in spight of every Exertion of the Crew, in the space of a very few minutes. There were frequently 2 and sometimes upon one of these peices of board, which must be devilishly overballasted; still by their Management, they apparently made very good Weather of it." saw people so active in the water, which almost seems their natural element." "Several of those Indians who have not got Canoes have a method of swimming upon a piece of wood nearly in the form of a blade of an oar, which is about six feet in length, sixteen inches in breadth at one end and about 9 at the other, and is four or five inches thick, in the middle, tapering down to an inch at the sides. At any rate, the presence of these journal entries (more than have been noted in histories of Surfing) emphasizes (at least to my mind) the great fascination these mariners had with surfboards and surfing. Their detailed accounts of surfboard sizes, shapes, and purpose is an important (and mostly undiscovered) link in why and how surfing manages to survive when so many other native pasttimes did not. I replied, mostly detailing historical details that have been added to the above paper. More than a maritime culture - an aquatic culture. As mariners, the journalists had a fascination with all things nautical - there are extensive accounts that relate to canoes, seamanship and navigation. Specifically, Cook was amazed that the Hawaiians were there before he was and was the first to suggest that Polynesian settlement was the result of extensive voyages from the west - a feat that preceded his own voyages. Given that some (unknown proportion) of the crew could not swim at all (Cook and, I think, King and note 7. above), Hawaiian familiarity with the ocean, where swimming was a basic community skill, must have been impressive. Obscure thought - Could Cook have saved himself, if he was able to swim? The origins of modern swimming are difficult to ascertain - a restricted amount of research has indicated to me that the development of the common crawl stroke (the Olympic freesyle) has at least some import from Polynesian, especially Hawaiian, swimming. I would propose that there is a technical relationship between 'native' swimming and board paddling - the combined overarm stroke and flutter kick. If this conjecture has any validity, then (as Hawaiian surf-riding has now expanded across all the world's oceans) Polynesian swimming has now expanded across the world's oceans, lakes and swimming pools. 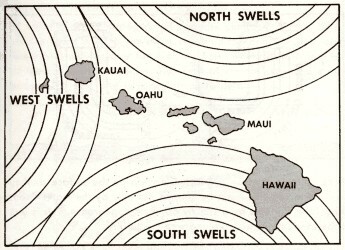 Confident of their skills, the Hawaiians chose the most extreme conditions ( 'great swell' -Samwell) for their 'diversion'. Even in Hawaii, good surf-riding conditions are not consistant, sublime conditions are rare, large and sublime conditions even rarer. If Cook had not had extended stays, or if social relations had been mostly confrontational, then we may not have these accounts. However, note that these accounts of prone riding seem mostly derive from Kealakekua Bay, Hawaii. Although this was probably the most populous area, at this time (winter) the bay was protected from the prominant swell direction from the north. A significant number of Hawaiian legends (see Finney (1996), Chapter 3) indicate that (the now extinct) Hilo Bay, on the opposite coast of Hawaii, was a centre of surf-riding excellence and exposed to the winter north swells, but none of the 1779 reports indicate knowledge of this. The other legendary centre was Waikiki, Oahu - exposed to the summer south swells and protected from the north. Photographic evidence (Edison, circa 1905) confirms that the surf-riding conditions of Wakiki for solid wood finless boards can be sublime. If Cook was searching for surf, then probably "he really missed it - he should have been there six months ago!" (paraphasing Brown, 1966). For each riding location ('surf break') there are specific features of paddle-out, take-off and the general wave characteristics. For each individual wave another specific set of variables is operational. Each wave (an animated expression of climatic forces?) is structually, aesthetically and temporaly unique in nature. An early representation of the wave as icon is Katsushika Hokusai (1760-1849) : Under the wave off Kanagawa c.1825?1831? The wave as icon retains its attaction in contemporary times - evidenced by the number of photographs of riderless wavescapes that are regulary printed. Finney's list of traditional Hawaiian riding and wave terminology (1996, Appendix A) and the early written reports appear to confirm that traditional riders transversed the wave face in the same manner as all subsequent riders. For Cook's crew, surf-riding was like no other previous experienced human activity - it was unique. In my opinion it is still the case that surf-riding is an unique human activity. The Hawaiians further advanced their activity by the development of specific craft to maximize their wave-riding performance. Board construction was a combination of highly developed craftsmanship and an access to a rich source of building materials - specifically the massive koa forests of the Hawaiian islands. This is easily seen in the accounts of the number, the size and the quality of workmanship of Hawaiian canoes. The earliest surboards were hand-shaped objects (a sculpture) and despite the application of modern technologies, the basic surfboard retained hand-shaping at least until the end of the twentith century. when so many other native pasttimes did not. Most native pastimes had some European equivalent - board games, wrestling, running, sailing, dance. Hawaiian surf-riding was a highly developed unique activity - and the waves are still there. Cook, James. A Voyage to the Pacific Ocean. Undertaken, by the Command of His Majesty, for Making Discoveries in the Northern Hemisphere. To Determine the Position and Extent of the West Side of North America; Its Distance from Asia; and the Practicability of a Northern Passage to Europe. Performed under the Direction of Captains Cook, Clerke, and Gorf, in His Majesty's Ships the Resolution and Discovery, in the Years 1776, 1777, 1778, 1779, and 1780. In Three Volumes. Vol. I and II Written by Captain James Cook, F.R.S. Vol. III by Captain James King, LL.D. and F.R.S. Illustrated with Maps and Charts, from the Original Drawings Made by Lieut. Henry Roberts, under the Direction of Captain Cook; and with a Great Variety of Portraits of Persons, Views of Places, and Historical Representations of Remarkable Incidents, Drawn by Mr. Webber during the Voyage, and Engraved by the Most Eminent Artists. Published by Order of the Lords Commissioners of the Admiralty. (London: Printed by W. and A. Strahan, for G. Nicol, Bookseller to His Majesty, in the Strand, and T. Cadell in the Strand, 1784). Volume 3, pages i-xii, 1-169. Swimming is not only a necessary art, in which both their men and women are more expert than any people we had hitherto fees, but a favourite divert on amongst them. One particular mode, in which they sometimes amused themselves with this exercise, in Karakakooa Bay, appeared to us moft perilous and extraordinary, and well deserving a distinct relation. An accident of which I was a near spectator, shews at how early a period they are fo far familiarized to the water, as both to lose all fears of it, and to fet its dangers at defiance. A canoe being overset, in which was a woman with children, one of them an infant, who, I am convinced, was not more than four years old, seemed highly delighted with what had happened, swimming about at its case, and playing a hundred tricks, till the canoe was put to rights again. * and amusement, somewhat similar to this, at Otaheite, has been described Vol II page 150.